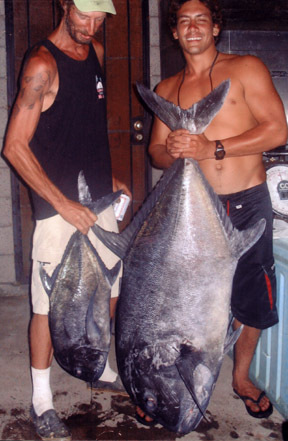 Kamana Helekahi and his fishing partners were entered in the 2004 Three Strike Pole Benda fishing tournament but found the spot where they had hoped for fish already occupied. They moved on to another location and at 2:30 a.m. Kamana took a huge strike on his custom Sabre pole. His extended 4/0 reel's drag was smoking and Kamana remembers smelling the washers burning as he tried to pull the pole from its holder. After a long, tiring battle, his buddies gaffed Kamana's ulua and then the party started. The fish earned Kamana first place in the tournament and immortal entry in HFN's 100-Plus Club.